BRIDGETOWN, Barbados – Half-centuries from emerging talents Jonathan Drakes, Amir Jangoo and Kjorn Ottley helped Combined Campuses & Colleges Marooners enhance their chances of reaching the semi-finals of the Super50 Cup and earn bragging rights over territorial rivals Barbados Pride with a comprehensive, 125-run victory in their crucial Group “B” match on Thursday here. Drakes hit the top score of 70 from 98 balls spiced with half-dozen boundaries, Jangoo supported with 62 from 76 balls and Ottley made 57 from 67 balls, as the Marooners fortified their hold on second place in the group with a bonus point victory that carried them to 20 points. 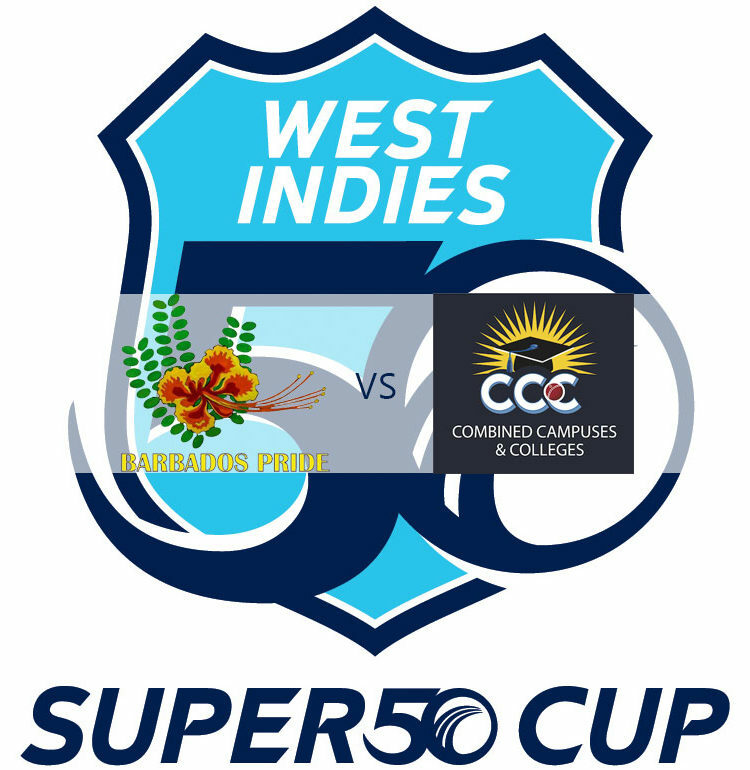 In the other Group “B” contest: A boundary-studded, fourth Super50 career hundred from Rahkeem Cornwall laid the groundwork for a 47-run victory under the Duckworth/Lewis/Steyn Method for Leeward Islands Hurricanes over the United States. At Kensington Oval:The Marooners entered the contest tied on 15 points with the Pride and a superior net run rate that put them second in the group, behind runaway group leaders Jamaica Scorpions. Ottley slammed five fours and three sixes and dominated an opening stand of 74 with Kyle Corbin that set the tone for the rest of the Marooners’ batting, as they posted 259 for seven from their allocation of 50 overs – their highest total ever in this format against the Pride. After Ottley was dismissed to leave the Marooners 95 for two in the 20th over, Drakes joined Jangoo and either side of a near hour-long break for rain shared 104 for the third wicket to fortify the Marooners’ position. Marooners were 195 for two entering the last 10 overs and typically lost a few wickets needlessly in trying to increase the scoring rate. Shamar Springer was the Pride’s most successful bowler, bagging 3-48 from eight overs, and Kevin Stoute snared 2-40 from 10 overs. Left-arm spinner Yannick Ottley, Kjorn’s brother, and Marooners’ captain Carlos Brathwaite, the WINDIES Twenty20 International captain, then shared six wickets between to undermine the Pride batting and dismissed them for 134 in 35.1 overs. Ottley grabbed 3-24 from 10 overs to destroy the Pride top order and Brathwaite belatedly introduced himself into the attack to run grab the last 3-12 from 3.1 overs. Jonathan Carter’s 26 was the best effort with the bat for the Pride, who lost for the second time in the tournament to their Barbados-based rivals – and by their widest margin ever to this opponent. At the Three Ws Oval: Cornwall put his hitting power on display to lead the Hurricanes to 248 for seven, after wet conditions caused by rain forced a reduction of the innings to 49 overs. When Cornwall entered, the Hurricanes were wobbling on 74 for four in the 21st over, but he led a remarkable recovery, cracking six fours and 10 sixes in an undefeated 125 from 93 balls. He found Orlando Peters a worthy ally and they put on 114 for the seventh wicket at the height of the fight-back. Left-arm spinner Nosthusha Kenjige was the most successful American bowler, taking 3-62 from eight overs and Trinidad & Tobago-born fast bowler Kyle Philip captured 2-28 from his quota of 10 overs. United States then limped to 131 for seven off 36 overs when rain brought an early end to the match, with the Americans short of the required target.